On the processing side is miniDSP's innovative software & firmware allowing a Plug & Play real time control of the onboard DSP over Ethernet/Wifi networks. Using our Zero Conf technology, multiple modules are automatically discovered and controlled from a single User interface in real time. The platform is supported under Mac and Windows environment.The onboard Digital Signal Processors (DSP) provide real time all the processing a speaker designers will expect to excel at his crossover design task. These include FIR + IIR filters, Parametric Equalizers (PEQ), Level, crossovers, comp/limiter, delay and more. The Graphical User Interface (GUI) platform is supported on both Mac and Windows environment. 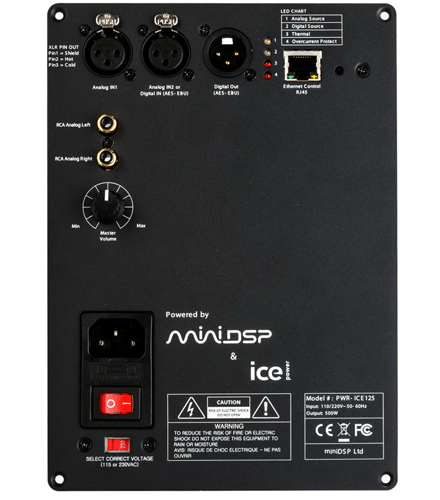 As for audio connectivity, the PWR-ICE250 is fitted with both analog balanced (XLR) & unbalanced inputs (RCA) to provide maximum compatibility. A digital input (AES-EBU/SPDIF) saves on the A-D conversion for maximum performance while a Digital output (AES-EBU/SPDIF) allows multiple plate amplifiers to be linked to each other. In this application note, we will show you how to design and build your own DSP-controlled active loudspeaker with the miniDSP ICE-PWR125 DSP plate amplifier. Note that a similar project could be built using the PWR-ICE250 if additional power is required. In this application note, we will show you how to design and build your own DSP-controlled subwoofer with the miniDSP PWR-ICE125DSP plate amplifier. Note that a similar project could be built with the PWR-ICE250 if added power is required. John Reekie from Hifizine, the enthusiast's audio webzine, documented an amazing design in the following 2 part articles. This is a prototype speaker dubbed the "Mini Convertible," which uses drivers from Seas of Norway (http://www.seas.no/) and a miniDSP PWR-ICE125 plate amp for amplification and DSP crossover. The prototype has a removable baffle for experimentation with different baffle profiles and cabinet bracing, but the final speaker will have the baffle glued (i.e. no screw holes).